Ski all inclusive in La plagne : compare ! All inclusive skiing in La Plagne, winter sports resort located in the Tarentaise valley, form with the resort of Les Arcs, the domain Paradiski. The latter covers an area of ​​10,000 hectares and extends over four municipalities, namely Aime, Bellentre, Champagny-en-Vanoise and of course Macôt-La Plagne. This winter sports resort has 225 km of marked trails but also a gigantic unmarked space. Equipped with 8 gondolas, 38 ski lifts and 2 cable cars, La Plagne is an area considered modern and easy to move around. In addition, La Plagne has the only Bobsleigh track in French territory. This track was built to host the Albertville Olympic Winter Games in 1992. 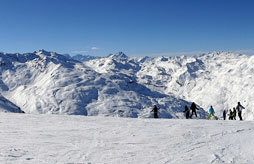 Ski Express offers to compare the many ski packages to La Plagne to find the best offer for you. Save on your accommodation by preferring the packaged offer and by pooling rental, lift pass, ski rental and meals. Your all inclusive snow holiday will allow you to take your whole family without breaking the bank. In a grand setting, ski in the vast Paradiski domain at a small price and find your all inclusive ski hire in La Plagne with Ski Express while benefiting from quality services. Indeed, the offers come from professional partners of the skiing which guarantees a very good value for money.